I've resigned myself to being the last man in on Seabiscuit, a big budget movie with tons of critical acclaim, but painfully lackluster box office interest. My interest in four hoofed filmmaking began with a childhood obsession with The Black Stallion. In spite of that background, the hype never got me interested in Seabiscuit. Judging from theater attendance, most of you agree. Critics may like it, but now that I've seen it, I can't say we were wrong in staying away. 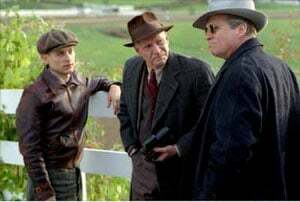 Seabiscuit is the story of a boy and his horse, the horse's trainer, the horse's rich owner, the other guy who rides the horse, and the horse's rich owner's newer prettier wife. 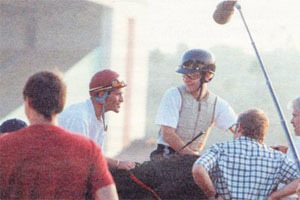 Because of that, the film is initially bogged down in a series of poor edits following three separate story lines as director Gary Ross struggles mightily to bring his characters together around a fourth story, a horse named Seabiscuit, who drops into the movie after a half hour or so of editing confusion. I'm not sure what I was hoping for from Seabiscuit, but it wasn't this. Eventually it does become a story of triumph over adversity, of the little guy winning it all. But before it gets to any of that it's a joke. A mish mash of voice over narrative, hammering you on the head again and again with how historically important the story you're about to see is... instead of just getting around to showing it. Once the Seabiscuit team gets together though, they're like the Justice League. The movie starts inserting artificial sentimentality and sappy "beat the odds" scoring... which works. At some point, you forget about the initial suffering Seabiscuit puts you through, and it’s all about watching the Biscuit Squad make the world a safer place for the common folk. Without all that ill considered jumping around, Cooper, Maguire, and Bridges are free to deliver wonderful performances as slightly damaged characters from very different worlds. What binds them together is not so much their love of horses as their love of winning. If they did love the horse, other than a few pretty touching scenes between Pollard and the Biscuit, this movie doesn't show it. Frankly, the horse himself is a pretty underdeveloped character, even though he's the focal point of the movie. You could have just as easily substituted in any random NASCAR, or even Lance Armstrong's bicycle and achieved the same result. I hear that talking car of Michael Knight’s may be looking for movie work. Hopefully, I don't sound overly cruel. Seabiscuit wraps things up in such a high strung little package it’s very easy to forget the initial disaster of its beginnings. Maybe that’s why it has gotten such a glowing recommendation. But Seabiscuit is a permanently flawed heart-string-puller that's been over hyped into the next big thing for Oscar. Ultimately what it really achieves is a fairly entertaining, artificially emotionalized tale of patriotic achievement that covers over its mistakes with touching music and some damn fine acting. That's enough to make the Biscuit worth seeing, but not enough to warrant so much critical attention.